Edit a theme to modify the colors, fonts, or effects. Theme colors contain four text and background colors, six accent colors, and two hyperlink colors. Under Sample, you can see how the text font styles and colors look before you settle on your color combination. Select Colors, and then click Customize Colors. The Create New Theme Colors dialog box opens. 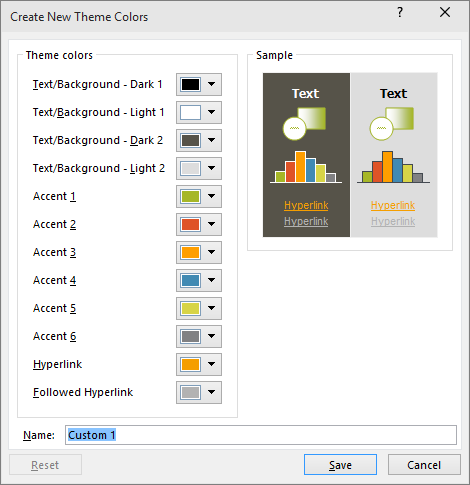 Select the button next to the name of the theme color element (for example, Accent 1 or Hyperlink) that you want to change, and then choose a color under Theme Colors. On the Standard tab, select a color. On the Custom tab, enter a color formula number for the exact color that you want. Repeat for all of the theme color elements that you want to change. In the Name box, type an appropriate name for the new combination of theme colors, and then select Save. Tip: If you want to return all theme color elements to their original theme colors, select Reset before you select Save. Changing the theme fonts updates all of the title and bullet text in your presentation. On the View tab, select Slide Master. Then on the Slide Master tab, select Fonts , and then Customize Fonts. In the Create New Theme Fonts dialog box, under the Heading font and Body font boxes, select the fonts that you want to use. In the Name box, type an appropriate name for the new theme fonts, and then select Save. Theme effects include shadows, reflections, lines, fills, and more. While you cannot create your own set of theme effects, you can choose a set of effects that work for your presentation. On the View tab, select Slide Master . Then on the Slide Master tab, select Effects . You’ll want to save the changes that you make to the colors, fonts, and effects as a theme (.thmx file). That way, you can apply this new theme to your other presentations. On the View tab, select Slide Master. Then on the Slide Master tab, select Themes. In the File name box, type an appropriate name for the theme, and click Save. Note: The revised theme is saved as a .thmx file in the Document Themes folder on your local drive, and it's automatically added to the list of custom themes on the Design tab in the Themes group. When you click Colors in the Themes group, the colors that you see next to the theme name represent the accent and hyperlink colors for that theme. If you change any of these colors to create your own set of theme colors, the colors that are shown on the Colors button and next to the Theme name will be updated accordingly. The Theme Colors gallery displays all the color sets from the built-in themes. As shown below, theme colors contain four text and background colors, six accent colors, and two hyperlink colors. Under Sample, you can see how the text font styles and colors look before you settle on your color combination. On the Design tab, in the Themes group, click Colors, and then click Create New Theme Colors. 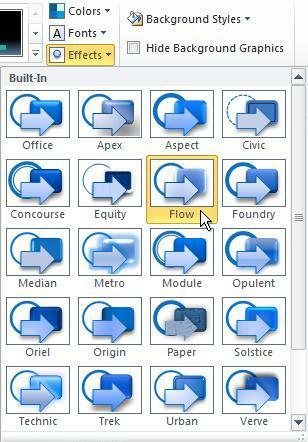 Tip: The colors inside the Colors button represent the theme applied to your presentation. Under Theme colors, click the button next to the name of the theme color element that you want to change. Click the down arrow of the color that you want to change, and then choose a color from the main list. On the Custom tab, enter a recipe for a color that you want. Repeat steps 2and 3 for all of the theme color elements that you want to change. Tip: Under Sample, you can see the effect of the changes that you make. Every Office theme defines two fonts — one for headings and one for body text. They can be the same font (used everywhere) or two different fonts. PowerPoint uses these fonts to construct automatic text styles. Changing the theme fonts updates all of the title and bullet text in your presentation. When you click Fonts in the Themes group, the names of the heading font and body text font that are used for each theme font appear below the theme name. As shown below, you can change the heading and body text fonts of an existing theme to meet the style of your presentation. Under Sample, you can see samples of the heading and body text styles that you've chosen. On the Design tab, in the Themes group, click Fonts , and then click Create New Theme Fonts. Theme effects are sets of lines and fill effects. 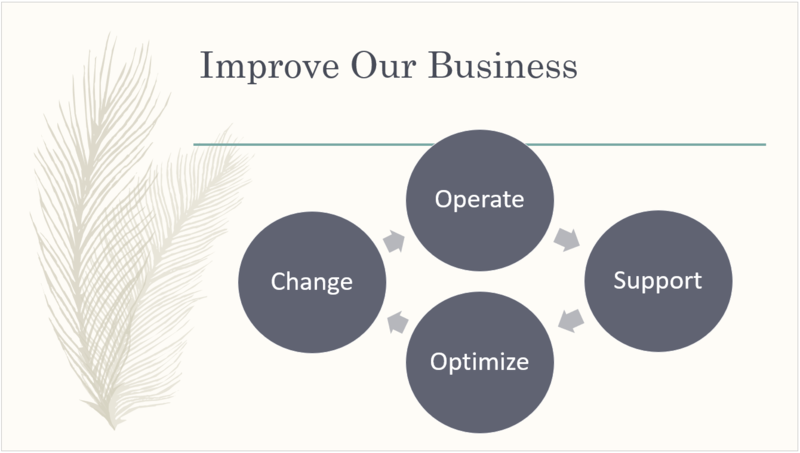 As shown below, you can choose from different groupings of effects to meet the style of your presentation. Although you cannot create your own set of theme effects, you can choose the effect that you want to use in your own document or presentation theme. 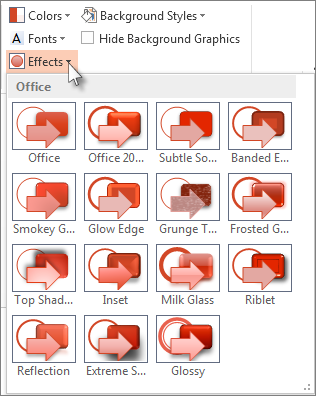 On the Design tab, in the Themes group, click Effects . Save the changes that you make to the colors, fonts, or line and fill effects of an existing theme so that you can apply it to other documents or presentations. On the Design tab, in the Themes group, click More . Tip: The revised theme is saved as a .thmx file in the Document Themes folder on your local drive and it is automatically added to the list of custom themes on the Design tab in the Themes group. 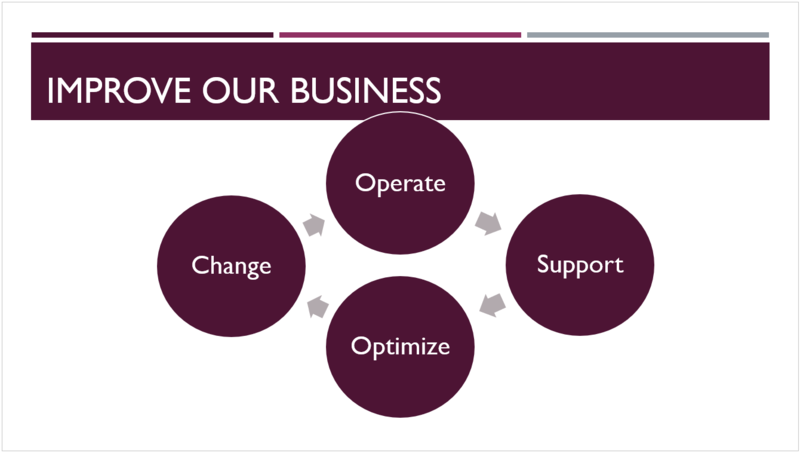 A theme is a design scheme of colors, fonts, and background that you apply to your slides. 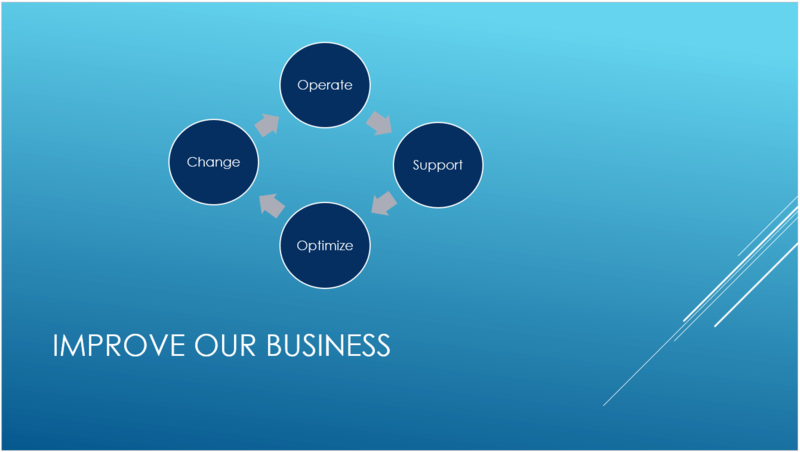 Using a theme gives your presentation a harmonious appearance with minimal effort. 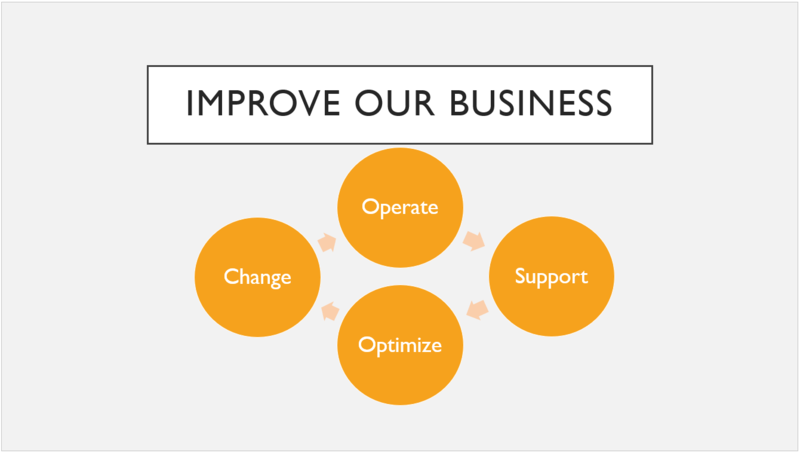 Text and graphics automatically take on the size, colors, and placement defined by the theme, which means less manual work as you create individual slides. After you create a theme, it's located on the Design tab in the Themes gallery. To try out a theme, rest your mouse pointer over a thumbnail in the Themes gallery and notice how the look of your slide changes.